You’ll love this Classic New York Cheesecake, nestled in a spicy Gingersnap Crust, and topped with a sweet and seasonal Persimmon topping! Good morning my friends! It’s Tuesday and we are coming off of a long weekend. I hope you had a good one! Before they arrived, I took an afternoon to bake up this simple cheesecake and try a new-to-me ingredient! 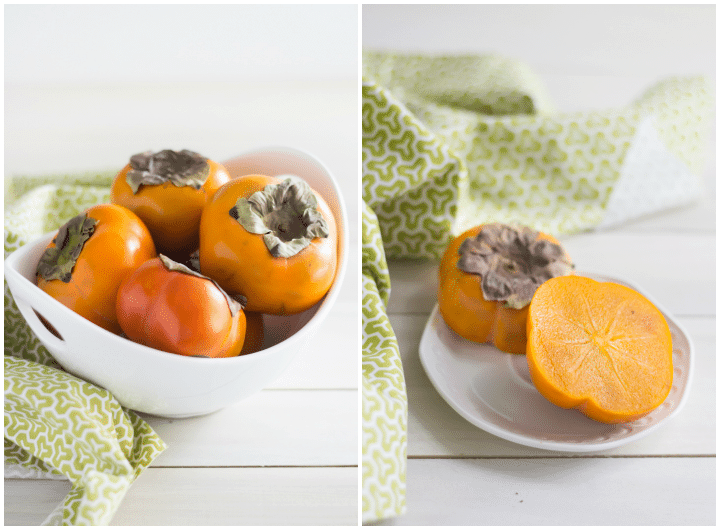 Have you ever tried a persimmon before? Every year right around this time, I see them at my local market, but I’ve never really known much about them. So, last time, I picked up a few and and gave them a taste. They’re really good! Nothing at all like I expected, lol. They look like a tomato, and for some reason I exected them to be really slippery textured and and tart/spicy, but I couldn’t have been more wrong! They are extremely mild and sweet, and the texture is more like a pear or a very firm plum. I just cooked them down and pureed them, adding a little lemon to bring out the flavor. The topping works really well with the creamy cheesecake and spicy gingersnap crust. You'll love this Classic New York Cheesecake, nestled in a spicy Gingersnap Crust, and topped with a sweet and seasonal Persimmon topping! Preheat the oven to 400 degrees F. Lightly mist an 8-inch (straight-sided) cake pan with nonstick spray, and line with a circle cut from parchment. Process the gingersnaps finely in a food processor. Stir in the melted butter, and press the mixture into the bottom of the prepared pan. In a large mixing bowl, mix the cream cheese, sugar, and flour on medium speed until well combined. Stir in the egg yolk, cream, vanilla, and salt, and pour the mixture over the gingersnap crust. Place the cheesecake pan into a larger pan, and fill the larger pan with about an inch or two of hot water. Bake for 20 minutes, then lower the oven temperature to 200 degrees F and bake for an additional 75-90 minutes, or until the cheesecake is set around the edges but still slightly jiggly towards the center. Turn the oven off and prop the door open with a wooden spoon. Allow the cheesecake to come to room temperature. Chill completely in the refrigerator before inverting onto a serving platter. Top with persimmon and whipped cream. Core the persimmons and chop them roughly. Place them in a small pot along with the sugar and water. Cook over medium-low heat, stirring occasionally, until they are very soft. Puree the mixture in a blender or food processor, until smooth. Stir in the lemon juice. Spread the mixture in an even layer over the cheesecake. Whip the cream and powdered sugar until soft peaks form. Pipe rosettes around the edge of the cheesecake. This cheesecake can serve a crowd! Which is exactly what we are “virtually” doing for my friend Meggan from Culinary Hill. She just had a little baby girl and so a few of us have gotten together to give her a little baby shower. There are lots of delicious recipes here, so please be sure to click around and have a look! And don’t forget to drop by Culinary Hill to congratulate Meggan. Tell her Allie sent ya! Special thank you’s go out to Nagi of Recipe Tin Eats for inviting me to be a part of this fun event! Nagi, your Lamingtons look amazing girl! Allie, you have just solved a mystery for me! I’ve been seeing persimmons in my local supermarket for a while now, too, and kept meaning to find out what they were/what they tasted like but just never did. Now you’ve tested them out for me, I should give them a try, too! Lol thank you Helen! Yes you should definitely not be afraid of persimmons- they are really lovely and I will be adding them to our fruit bowl from now on! Allie, your weekend sounds fabulous. . glad you got to spend some precious time with your nieces. . and I LOVE persimmons!!!!! Growing up my mom always had persimmons in the house! and this cheesecake is glorious!!! Happy baby shower to Meggan!! No kidding Alice?! Did you just eat them out of hand or did she bake with them? Thank you June! I’m so happy you liked it! It sounds like you had a blast over the weekend, Allie. 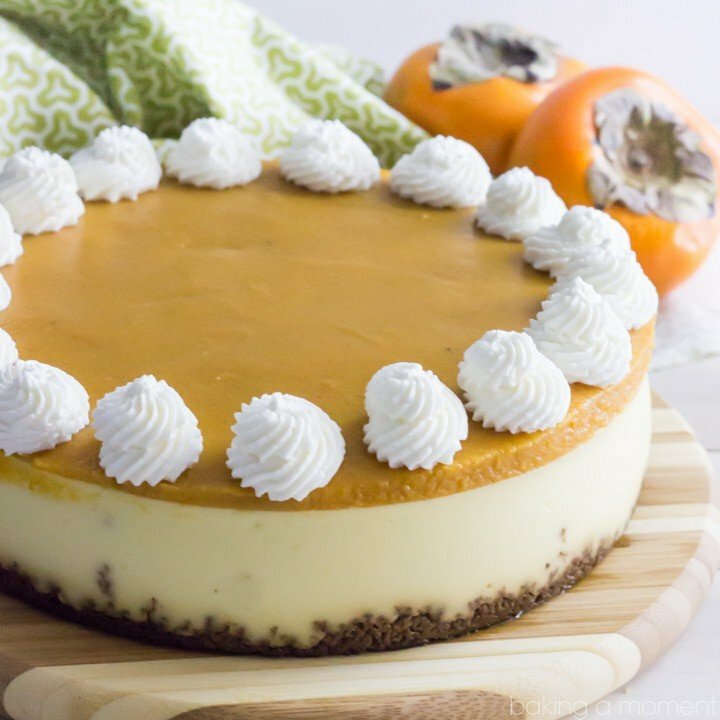 I do love persimmon and this cheesecake is so droolworthy! Happy baby shower to Meggan! So nice when friends get together for a virtual shower. It is! I was so grateful to have been invited to this one. Thank you so much Linda! I love persimmons! I would have never thought to make a puree out of them though. Fabulous idea for a cheesecake, Allie! Thank you Maggie! I really liked how it all worked together with the creamy cheesecake and spiced crust. Lol thank you Samina! I wish I could send you some! Glad you had a nice long weekend Allie! I love persimmons, but never thought they would make a great topping for cheesecake. Sounds and looks delicious, perfect for a baby shower! Thanks Mira! It was such a pleasure teaming up with you for this! 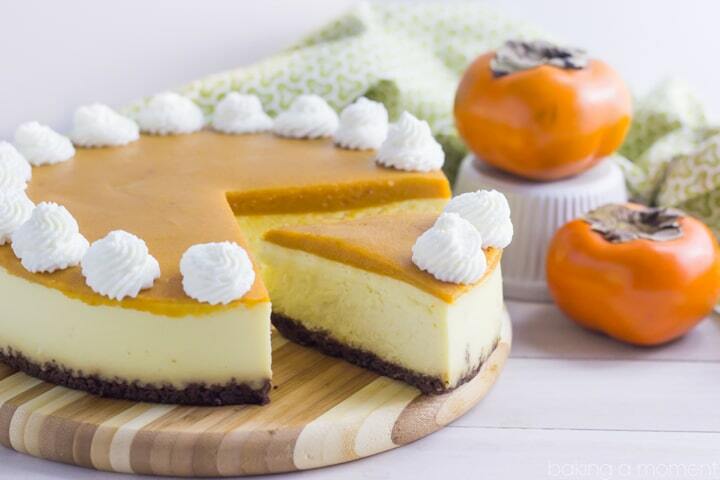 I have never had a persimmon before but after seeing this cheesecake I want to try one. I love that you say it isn’t like you expect it to be. I see tomato all the way and wonder how it would taste. Nothing like a tomato, lol! They were extremely sweet and kind of had a pear-like texture but with a thin, waxy skin like a plum. You should definitely give them a try! There are so few seasonal fruit options at this time of year. You know I just tried a persimmon not too long ago and by itself it doesn’t have a lot of flavor, but I am sure with lemon and sugar it really bring out the flavor. This cheesecake looks so pretty. I really love your photos. I thought the same thing Nicole! There wasn’t a whole lot of flavor there except sweet. The lemon really helped them out and so did the gingersnap crust. Thank you so much hon! YOU’RE KILLING ME HERE. THAT GIF!!!!!!!! Never had persimmons, but I’m changing that ASAP for this cheesecake. They were nothing at all like I expected- in a good way! Thanks Graham! I. Am. Dying. This is so gorgeous and so creative! LOVE!!! Amanda you are too kind! First of all this is just gorgeous!! I never thought of baking with persimmons and I love them. Genius. And secondly, I keep telling myself I need to use a cake pan to bake a cheesecake one of these days. But after my fail this weekend, I think your technique is just what I need to revisit that recipe. When you invert the cheesecake after chilling, does it just pop out? Your edges look so smooth so I am assuming it does! It does, so long as I’ve sprayed the pan well and lined it with parchment. Also, sometimes I have to warm the bottom of the pan just a little bit. For this I would use a hot towel or even just a very low flame on my gas stove. Just enough to take the chill off so that things slip a little more easily. Thank you Z! I don’t think I’ve ever tried a persimmon! But now I want to … and then make cheesecake!! haha Looks delicious Allie!! Allie, this cheesecake is just gorgeous!! Congrats to Meggan and what a perfect dessert to celebrate with! My mom is a huge persimmon fan and we always had them around the house this time of year but I have never tried baking with them before. I love that you cooked them down and pureeed them for the topping. Such a creative and delicious idea:) Your photos and that gif are just stunning too! Love everything about this post! Thank you so much Kelly! It sounds like you are a persimmon lover from way back- so it really means a lot that you liked this idea. Hope you had a great weekend sweetie! I see persimmons all the time at the store, and in a bunch of recipes, but I’ve never used them or even tasted them! Thank you so much for describing them – because to me, they looked like a tomato or even tomatillo. I will definitely pick up a few the next time I’m at the store so I can give them a try! And wow, this cheesecake looks phenomenal! Truly exquisite! Thank you Kathleen! I think you will be pleasantly surprised when you taste your first persimmon! I should mention though that I used the more squat-shaped Fuyu persimmons, which I understand are less astringent than the more oblong Hachiya variety. Good luck and enjoy! Allie, this cheesecake looks perfect! I’ve never had permissions, but I would totally try them in this cheesecake! What a fun thing to make for your family. Hope you had a good long weekend! So glad you gave these a try — it looks gorgeous! I’ve never tried one either yet, but they sound so good! They really are Ashley! I don’t know why it took me so long to try 😛 Thanks sweetie! I was extremely flattered to have been asked! I’m so happy for you Meggan- I hope you enjoy every second of this magical time. That little girl is just too precious. Congratulations my dear, and much love to you and your beautiful family! I need to try this! I’ve been eating persimmons raw for years, but never baked with them because I couldn’t figure out what dish to use them in. I never thought about putting them in a cheesecake– it’s perfect! Also, that gif is magic. I wish I had your piping skills! Thanks Bhiravi! Years of practice, lol! I thought the persimmons worked really well with the cheesecake, and especially with the gingersnap crust. Thanks for the sweet comment! I’ve never tried persimmons either, but what a great way to use them. This cheesecake looks delicious! Thanks Tori! I’ve never really had them before, so I don’t know if this was right or wrong, but I thought it tasted really nice! Yeah for Meggan! I love her! This cheesecake is gorgeous. The color is stunning. I have only had persimmons a few times. I never know really what to do with the. But I think this is my project next weekend now! I never knew what to do with them before either, lol! But this worked out pretty well I thought. Thanks Liz! Thanks Jess! I thought the persimmons were surprisingly mild and sweet. They really seem like more of a summer fruit to me- so it’s nice to have a taste like that at this time of year. Hope you had a fun weekend, sweetie! I’ve never tried persimmons before either! This cheesecake makes me want to add them to my grocery list now! Oh yeah, definitely pick some up next time! I feel like the fruit options are so limited at this time of year- it’s worth trying something new! Oh my gosh, this cheesecake is GORGEOUS! I haven’t baked a lot with persimmons and have only tried them once or twice, but I just know I would love this! What a gorgeous cheesecake! I am excited to hear about trying persimmons as a new ingredients! I always get excited when I tried something new that works out! Oh ya, same here! Persimmons are great; definitely a new favorite around here. Thanks Julianne! Wow! So pretty. I only bought a persimmon once and I had no idea how to eat it. Haha. As a cheesecake…that sounds delightful! I felt the same way when I first got home with the persimmons, lol! “…how do I…?” Now that I’ve finally figured it out, persimmons are going to be making a regular appearance around here. I’ll be cutting them into wedges and putting them in my kids’ lunches! Thanks Melanie! Lol same here Nagi! It was such an honor to be a part of this shower for Meggan. Thank you so much for organizing it, and for allowing me to be a part! I love persimmons! They’re one of my favorite underappreciated fruits. I can imagine how perfectly they go with this cheesecake–genius idea! They are so totally underappreciated, right? Why is that??? We need to change this asap. Thank you so much Elizabeth! Um this is GORGEOUS. 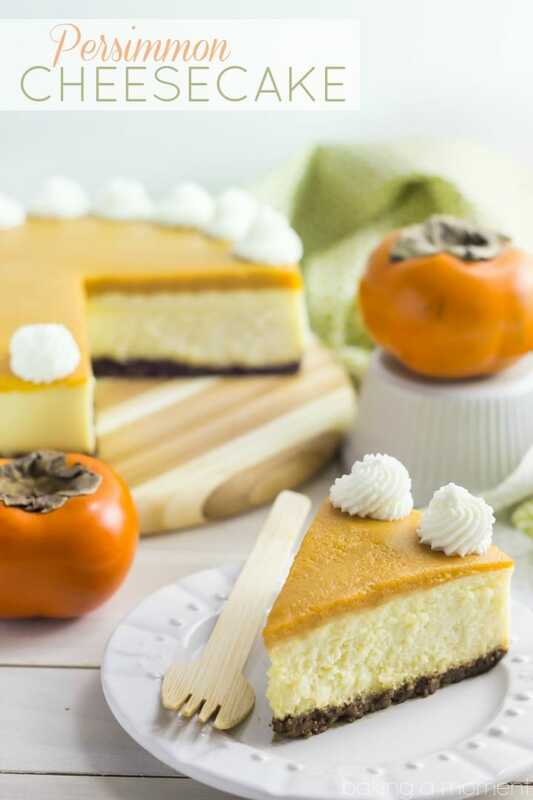 Cheesecake is my favorite dessert in all of life, and I love persimmons too! I always try to grab them at the farmer’s market. Thank you Shikha! And now I will too! Would love to try this recipe since we have about 150 Hachiyas – would it work? You show fuyus, which have a drier, firmer texture. Hi there! I’ve only ever tried it with the kind of persimmons you see pictured, but I would think it would still work. Good luck!